Hello my friends! What a week it has been, warm and cold and rain and snow. Bookman went to Las Vegas for a couple days to visit his parents who celebrated their 60th wedding anniversary. I was not able to go but that is ok since I had my first bike ride of the year today I had to get ready for. 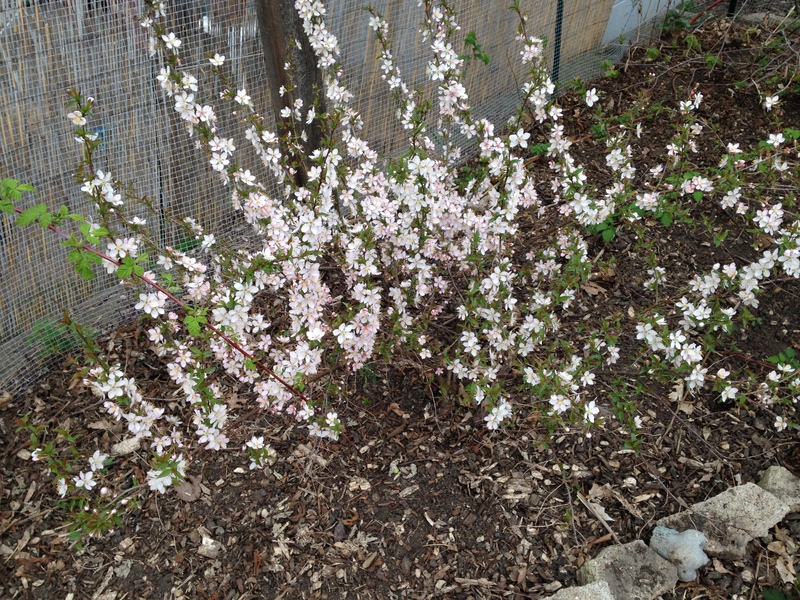 The warm weather earlier in the week encouraged the cherries to bloom. The bush cherries and the cherry tree. I’ve had the bush cherries since they were not more than twigs so it is a happy thing they are doing so well. 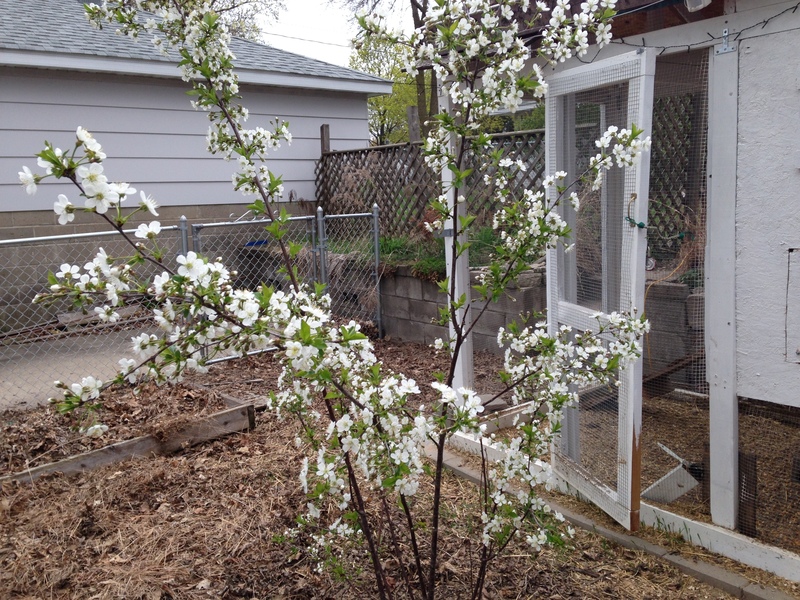 The tree we just planted last spring in the chicken garden and was already past bloom when we got it. It had one cherry on it. So I wasn’t expecting much from it this year and am pleasantly surprised by the profusion of blossoms. Of course a day after all the flowers burst open it rained. And it rained the next day. And the next and then it snowed a little but didn’t stick. I have been worrying about the blossoms but they are holding on pretty well in spite of everything. It was somewhat warmer and dry yesterday, even sunny for a little bit, and I was happy to see a bee buzzing around. Hopefully it was not the only bee who came to visit, I want some cherries come summer! The apple trees are getting really close to bursting into flower. I think after this cold front tonight and tomorrow passes when the sun comes out and we get a little warmth, they will unfurl in all their glory. Cherry blossoms are pretty, don’t get me wrong, but I am just a little partial to apple blossoms. I peeked at the peas we planted yesterday and some of them are beginning to poke up, no leaves yet, just the uncurling stem as it pushes up through the soil. A heartening sight to see! None of the other seeds we sowed have decided to sprout yet, but I am hoping that will happen by the end of the week when we are promised some warm, sunny days. No chicken traumas this week. Marianne did slip outside the fence for just a bit though. She wasn’t traumatized by it but I was! There is part of the backyard that has a fence and then about a meter of garden that is still ours on the other side of the fence that is contained by a meter high retaining wall and then a small concrete parking pad for our car and the city bins. Marianne managed to slip around the fence and was happily scratching away in new territory. I saw her out there when I poked my head out the door to check on the Dashwoods. I quick put my shoes on and hurried out, stood on the concrete, leaned against the retaining wall and tried to get Marianne’s attention. She was so focused on scratching she didn’t even know I was there. So I gave her a poke. She looked at me — what? — and then went back to scratching — don’t bother me lady can’t you see I’m busy here? All the talking and poking was blatantly ignored. So I gave her a shove. I got a glare. Then ensued some slapstick comedy as I tried to herd her back into the garden and she did her best to go everywhere but. Just as I decided I had to grab her and move her myself, I look up and here comes Elinor — hey, whatcha doing? She realizes she is outside the fence and is super excited about it and the unscratched ground. She decided to be even more recalcitrant than Marianne — You clipped my beak, you owe me! So now I was chasing two chickens who did not want to go back into the garden. I’d had enough, it had gone on far too long. I scooped up Marianne who let me know right away she was not pleased — Squawk! I dropped her back in the garden, she shuffled her feathers into place and went about her business as though nothing happened. I looked at Elinor. She looked at me — Oh no you’re not! — Oh yes I am! And before she could do anything about it I scooped her up. She made a big fuss and when I put her down in the garden she ruffled her feathers indignantly and stood there glaring at me. Then she watched as I made sure they could not get back out. Her avenue of escape cut off, I headed up to the house to go back inside. She followed me all the way and then stood on the deck looking in the sliding glass door to make sure I knew she was not pleased. Eventually she rejoined the rest of the Dashwoods no doubt plotting some chicken revenge. Today I had my first organized ride of the year. 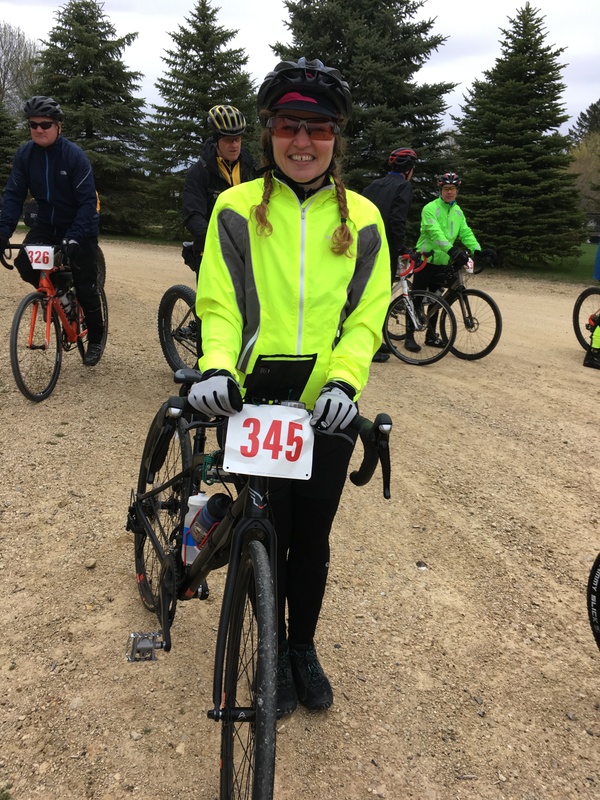 The Miesville 56, a gravel ride, not a race. It was 56 miles /90 kms of mostly gravel and dirt roads. It was cloudy, really windy — so windy there were a few crosswinds that blew me part way across the road — off and on raining, and only 37F/3C. 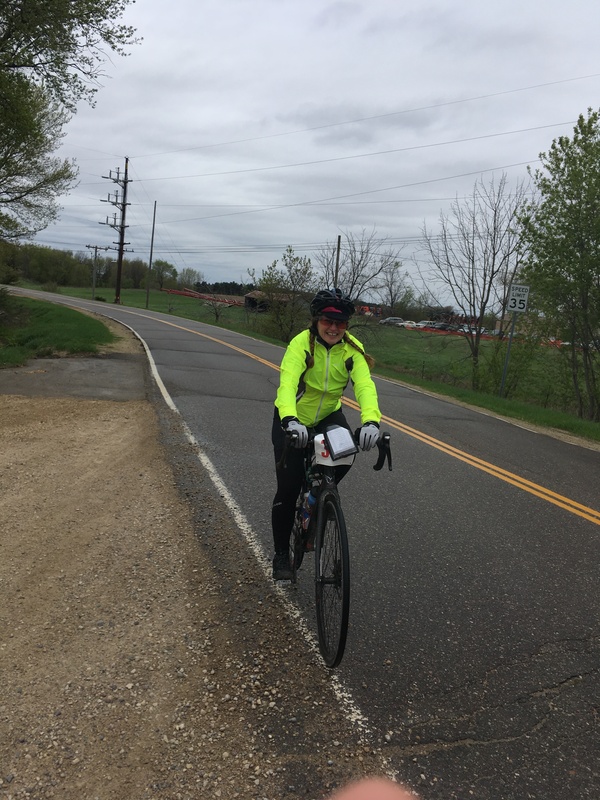 I had on a long sleeve jersey and a long sleeve cycling jacket, cycling shorts with leg warmers, my thickest cycling socks, a cap under my helmet to keep my head warm, and full-length cycling gloves with a second thin pair of gloves underneath. When I started my feet were already cold, half an hour later I could not feel my face, which made drinking and eating while riding an interesting challenge. But, ah, I thought, at least my hands won’t get cold. Well, they got cold too eventually. And even though I rode through some beautiful countryside I did not stop once to take any photos because I would have to take off my gloves and that was not about to happen. The one really good thing is I wore my hair in two braids instead of the usual one, and the braids somehow managed to keep my ears warm. Go figure. Riding gravel is slower than pavement and I estimated I would be done in about four hours. But the wind slowed me down and I finished in about fours hours and twenty minutes. Not bad all things considered! Bookman met me at the finish and when I stopped he had to hold my bike and I had to hold onto him because I couldn’t feel my feet, they were that cold! I had a great time though and will definitely go on the ride again next year. With luck, it might be a little warmer and a bit less windy. Love 💗 The chicken 🐥 story ! Hope it’s warmer for you next year! Thanks Helen! I hope it is warmer next year too but if not I will make sure to have warmer socks! Sounds like some adventurous chicken… maybe they wouldn’t mind an outlet like bike riding themselves? wanderwulf, a little too adventurous! Ha! Maybe I should get them all little bikes, or make a chicken trailer for my bike and tow them around the neighborhood. Ha ha, yes! You totally could! Chicken Revenge would be a good title for something. Jeanne, heh, it would, wouldn’t it? We have certainly had plenty of rain for a while to give all the plants time to green up but I know I am very much looking forward to drying out and having sunshine and a little warmth! Imagine Elinor or Marianne shuffling down the sidewalk in your neighborhood–wouldn’t that make for an amusing scene (less so for you of course). I wondered if they would try and get away if they were outside the fence, and it sounds like they do indeed have minds of their own when it comes to deciding which side of the fence they want to be on! If nothing else the cold makes you cycle faster! Hopefully your next ride will have more pleasant weather! We are expecting another chilly, rainy week here, too, I think! I don’t like the summer heat and humidity to start too early, but I don’t want it to be COLD in May, either! Love hearing about your chicken escapades! Laurie, I feel the same! I don’t want hot and humid but it would be nice to have some mild sunny days before summer arrives! Glad you enjoy the chicken escapades, they certainly keep things from being dull! Haha, love the chicken story of course. I think you need to have chicken-cam to capture all these for us. And well done on the bike-ride though like the others I hope you have been weather next year. Glad you had the two-braid hair solution to help you. Oh, and congrats to Bookman’s parents’ on their anniversary. A great achievement. whisperinggums, chicken cam! I love it! Thanks! My next ride is coming up this weekend and the forecast is looking perfect. Oh you know the Dashwoods are plotting some kind of revenge! haha.. Their stories are always fun. That’s great you were able to get your first bike ride outdoors and congrats on making it through the wind, rain and cold!